With so many options, how do you know which one to choose? I wish I would have seen an article like this when I was hunting for a place to live in Paris a few months ago! Where you stay in Paris determines so many factors about your trip and can truly make or break your time in Paris. I was so unsure of where to live in Paris that I booked an apartment in the 1st arrondissement just to be safe, but I actually spent a lot of time outside of my neighborhood in other areas of the city and will definitely stay in another area of the city when I visit again! 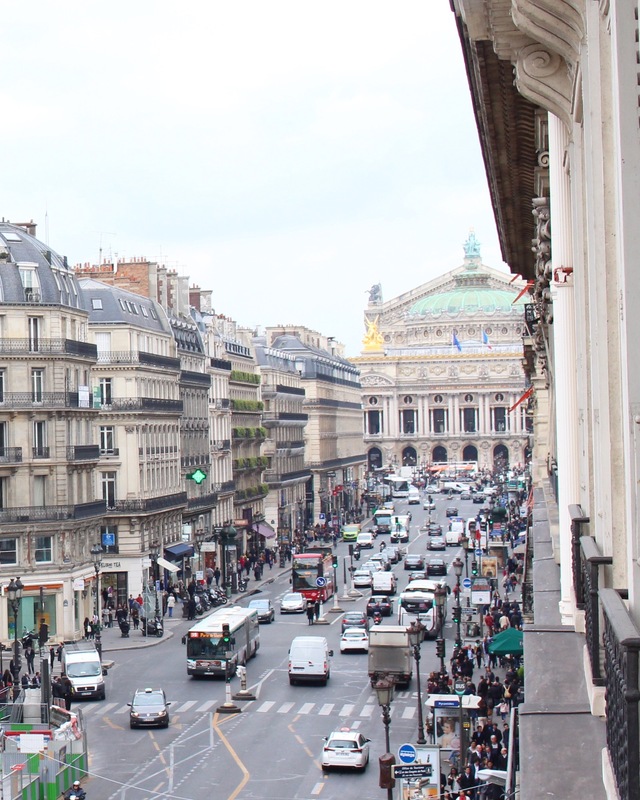 The photo below is a view from my apartment on Avenue of the Opera; the building at the end of the street is Palais Garnier or the Royal Opera. I enjoyed my time in this apartment but as you can see this street is a huge road in the business district that was full of tourists! The upside was that I was very well connect to the city via multiple bus and metro stops just outside my door (and I had double pane windows so noise wasn't a problem! ), but the downside is that business districts are closed on the weekends, so there were very few coffee shops and cafes open on the weekends in my neighborhood. There are a few factors that I want to encourage you to consider when looking for housing in Paris. Whether long term or short term, you'll have to consider: proximity to areas you're visiting and transportation, safety of the neighborhood, and your budget. I'm going to highlight three neighborhoods in Paris that you should target when looking for hotels or apartments to live in during your visit. There are plenty of great places to stay in the city and different neighborhoods are better suited for different types of visits, but each of these 3 areas of the city would facilitate an excellent visit to Paris. The 5th arrondissement is part of the "Latin Quarter" that you have most likely heard of if you have been looking for travel ideas for your next trip to Paris. I loved wandering the narrow cobblestone streets and having plenty of cafes and patisseries to choose from in the 5th. This neighborhood is very walkable which makes it ideal for exploring right outside of your doorstep. Of course, given the popularity of the Latin Quarter, there are some touristy streets, but once you're off the beaten path, it's easy to find the real Paris that you picture in your head - quaint shops and corner cafes, with many more Frenchies than tourists. Saint Chapelle and Notre Dame are very close to this area along with one of my favorite Parisian treats, Odette cream puffs! Le Marais is made up of the 3rd and 4th arrondissements and is on the right bank of the Seine; it's the place to be if you're not in a rush and really want to explore and absorb Paris. 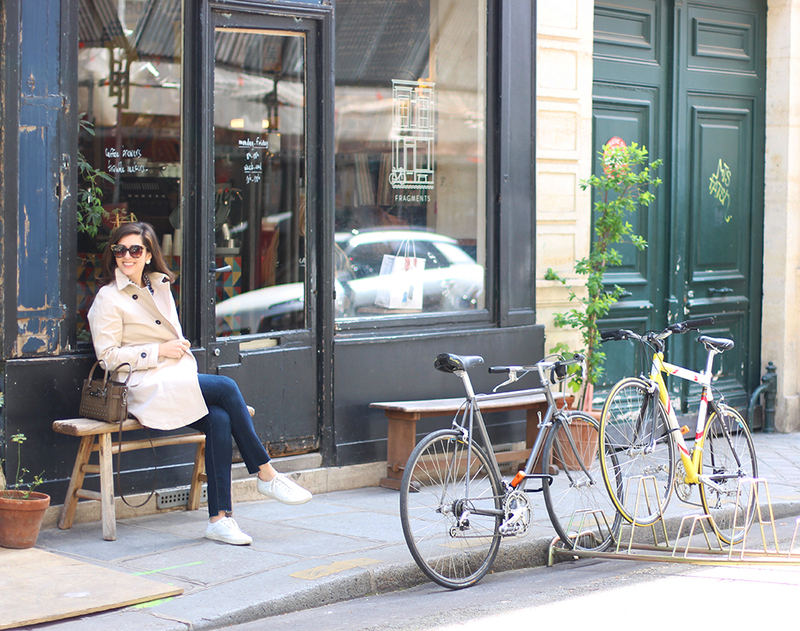 I often walked from my apartment to the Marais to people watch at a street cafe or for shopping at local boutiques. The Marché Montorguiel on Rue Montorguiel is a great place to explore- it's a pedestrian street and boasts many cafes, and shops like fromageries (cheese) and boucheries (butcher) to visit if you're looking for a snack or picnic supplies! Wandering around the 10th in Paris was actually a surprise to me because I didn't think I would enjoy it that much! I had a preconceived idea that any neighborhood "that far" away from the center would be a terrible place to live, but I was oh so wrong! Even though this neighborhood is farther from the city center, it is still well connected to the rest of Paris via public transportation; Gare du Nord and Gare du Est are two train stations and large metro stops nearby and make getting anywhere in Paris fairly easy. My first visit to the 10th arrondissement was to find the popular restaurant, Holybelly, and it quickly became a favorite! Once I got a little more comfortable with the area, I found out a friend lived nearby and after a tour of her neighborhood, I was sold! Definitely a budget saver, this neighborhood will give you a little more bang for your buck, but still has plenty to offer if you're looking for a place to enjoy the non-touristy areas of Paris. I used a few resources to plan my stay in Paris and did a lot of research about hotels before settling on an apartment. I recommend using Hotels.com or Expedia for your preplanning; you may even find a great flight deal to Paris via Expedia. I flew over on April 15th and I think my ticket was a little over $600, which is a pretty good deal! I did a lot of browsing apartments on Airbnb and HomeAway before eventually selecting my apartment in the 1st arrondissement. Be sure to read the reviews, make sure your apartment or hotel is within short walking distance to a metro stop, and book as far in advance as possible to get the best rates available! Bon voyage!